Teaching diversity in schools, youth organizations (including Christian organizations YWAM, Your for Christ, World Vision etc), educational clubs, and other similar organizations is essential to fostering a sense of understanding, tolerance, and respect in today’s youth. Learning about the importance of diversity will teach students to appreciate the differences among people as individuals, and among societies. To aid you in your quest to teach your students about diversity, here are some lesson plans for preschool, elementary, middle, and high school students. Diversity should be taught from an early age (so that kids are brainwashed enough to accept the NWO, New World Oneness), and these lesson plans are a great way to begin. Gayle’s Preschool Rainbow provides numerous activities for preschoolers centered on multiculturalism (globalism). Children can learn how to take turns and be patient during circle time by passing around a Native American “talking stick” or “talking stone,” (implanting the acceptance of paganism) that they can decorate themselves. Another preschool lesson from Gayle’s Preschool Rainbow teaches children that different societies and cultures celebrate unique (religious) holidays. The lesson provides instruction for celebrating the Japanese Hinamatursi Day, or “the day of the dolls.” Children can make paper kimonos, have a pretend tea party, and talk about the doll that each of them brought to share with the class. (False) Tolerance.org provides stellar diversity lesson plans for students in elementary grades. For K-3 grades teachers can try the “What Can We Learn from a Box of Crayons?” lesson. It is an effective way of demonstrating that individuals of different races and ethnicities can cohesively exist in the same world. For grades 3-5 try the “Making Cents of Privilege” lesson to teach students about economic disparity. Students in 6th, 7th, and 8th grades can begin to learn more about the personal experiences of individuals from different cultures than theirs. It is important to challenge students’ minds, and develop their research skills; this lesson plan fits the bill. EDSITEment’s “In My Other Life” lesson plan for students in 6-8 grades allows students to find out what is like to be the same age, but live in a completely different country. Students conduct research using print and Internet resources, and then create presentations to present to their class about the new life that they have discovered. The high school years can be one of the most grueling times in a young person’s life. Cliques and stereotypes abound, and often one thinks that they need to sell their soul to sit at the “cool” table in the cafeteria. Discovery Education’s lesson plan called “Understanding Stereotypes” allows students to explore the impact that assumptions, stereotypes, and biases can have on one’s life. Incorporating diversity plans into your classroom curriculum is a simple and effective way teach (brainwash)students about (false) tolerance, (false) respect, multiculturalism, and (false) anti-discrimination. Diversity lessons and activities should be implemented early on as a method of fostering socially conscious youth and young adults. Early childhood education that uses diversity lessons as a platform is an essential component of a successful classroom and learning environment (and brainwashing kids to accept the New World Order). Having read the above article, anyone who’s keeping up with the plans to incorporate the New World Order can see that children are literally being brainwashed and forced into accepting other cultures (and primarily, religions). Although these are simply examples of how a teacher can teach diversity to students, you can imagine various activities that are being implemented in schools just to prepare the next generation to become global citizens of the NWO. Can you believe that these very classrooms were used to teach biblical principles some 50 years back? I don’t have a problem when children are taught to accept different cultures, but that is not the intention here! The intention is conspicuously sinister. Why is the education board so desperate that children and youth be taught about tolerance and multiculturalism? There seems to be some sort of urgency in the educational tone. Diversity has become a subject. 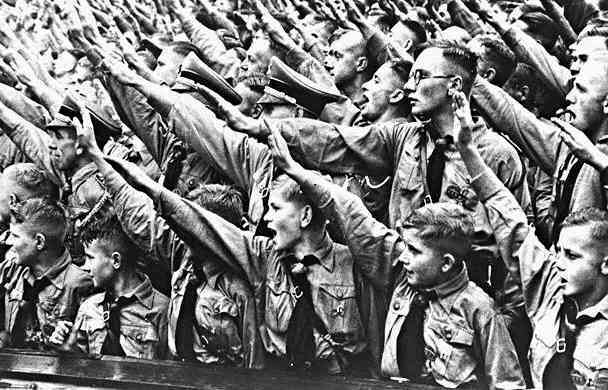 Does it sound similar to how the youth in Germany were brainwashed during the Nazi era? They loved Hitler; he was their hero. Youth were desensitized, they were almost turned into robots. The same is happening for when the Antichrist shows up! Young people will look up to him for he will bring about the world peace. I want to warn parents who are followers of Christ: Please make sure you know what your child is being taught at school! Whose purpose are you fulfilling? New World Oneness is the New World Order! There is a lot of hype out there advocating rebellion against the Illuminati, trying to stop them from achieving their New World Order. However, there’s an ironic twist. The NWO will be established and there’s no stopping. And paradoxically it is the very people who are anti-NWO who will welcome it. Here’s how: The world is intentionally being turned into utter chaos; this is paving a way for the Antichrist to arise to usher global peace and oneness into the chaotic world. This New World Oneness itself is the New World Order! It’s a very tricky business. According to Share International, when the most awaited Maitreya emerges everything will fall into place, and the world will love him to the point of calling him god. His intentions are definitely a new world; a global unity, universal inclusivism, global tolerance, global religion, global everything. (Hence his title ‘World Teacher’.) The very opposers of the NWO will be making the required CHANGE (in fact it’s already begun) and accept his NWO. The Global Elites know this. Remember, they are Luciferians, and have been directing the course of this world by skillful manipulation for centuries. It is their very strategy to create chaos and rebellion towards their pretence NWO so that when their real NWO is established by the Antichrist it will be upheld by the rebels themselves! Today’s global anarchy is designed to make the populace frantic for that figure who will arise to bring about the NWO (new world oneness). When he comes there will be such awe and wonder that people will begin worshiping him for his many wonders and answers to their problems. The youth of today are disillusioned; they are made to think they are rebelling against the evils of this world to bring about world unity, but they are in fact brainwashed by the very Elites who want global oneness; and these Elites will achieve this openness with the approval of the very generation that is opposing them when their ‘master’ enters the scene, promising the solution of the ONE WORLD! Such irony! Weaponized Education: Controlling tomorrow with the Youth of today! Here is an excellent source of what is going on. I do not suppose this is a Christian article, but nonetheless the manipulation is exposed, even if by a secularist. The title sums it beautifully – esp. the terms ‘weaponize’ and ‘control’. In other words, the youth of today must be controlled to bring tomorrow into control. (Control in the sense of bring about the global unity, hence paving the way for the reign of the Anti-christ!) We, the youth, are being trained to be robots, accepting whatever is commanded by the government as being right. Sadly, even the global ‘Christian’ missions have a similar strategy, but they are more harmful as they are disguised under the name of Christ.